Microblading is something I’d been very curious about for a long time. While some Before/Afters leave a little to be desired, some are truly incredible, with the power to change someone’s face for the better while still looking completely natural. After several months of considering it for my own brows, I finally decided to take the plunge and brought my photographer, Clarence, along for the ride to document it here. Please note: I was provided the procedure free of cost in exchange for my coverage of it. There were no requirements other than my honesty, and truthfully I could have just done a series of Instagram stories (which, to be honest, would have been far less effort!). However, I wanted to assemble something more thorough in case you, my readers, had been considering microblading but perhaps wanted more information on it. All thoughts and opinions are 100% my own. Read on for my experience, my thoughts on the results, and overall, whether or not I think microblading’s worth it! The result is VERY pointy eyebrows. I think it says something that every makeup artist I’ve ever had paint my face, without me mentioning it, has been quick to fill in those sparse spots. Throughout high school I used to pluck off the points entirely, until I finally came to appreciate them and let them grow in. (I’m lucky they DID grow back in!) I remember back in my college days, I’d just started working a part time job and I overheard two of my new coworkers laughing about my “Dracula eyebrows”. (They weren’t the nicest girls in the world.) Luckily, at that point, my brows weren’t something I was devastatingly insecure about, but it still shone a spotlight on something I was already aware of, had spent years plucking away at, and was not wild about. I was always curious about microblading, but since my brows are naturally decently full, I wasn’t sure I’d make a good candidate. Also, I was apprehensive: since I follow my share of microblading and eyebrow accounts on Instagram, it became very obvious to me that not all technicians are created equal. There isn’t some one size fits all approach, and there is major artistry involved. I’m talking not only the eye to envision what would look best given the canvas provided, but also the skill to follow through on it. I ultimately pulled the trigger with Piret Aava, aka The Eyebrow Doctor, after following her Instagram account for awhile and marveling at it on a daily basis. (With some accounts, I’d admire one photo but then be unimpressed by the next, the inconsistency of which was pretty scary to me.) I had heard of her impressive celeb clientele (including but not limited to Malin Ackerman, Olivia Palermo, and Serena Williams [!]) and felt that if I, an admitted perfectionist and control freak, could trust with my brows with anyone, it was probably her. With my reasonably full brows, I wasn’t sure if Piret might scoff me off as a poor microblading contender. But instead, without me even mentioning it (and like every makeup artist who’s touched my face), she zeroed in right on the spots I wanted to fix: those sparse outer patches near the arch. In fact, she felt we hardly needed to touch the front or middle of each brow, an assessment I’d hoped she’d give and that I was relieved to hear. So we agreed to focus entirely (save a strategic stroke or two towards the front, just for better symmetry) on the shape and fullness of my arch. She drew the strokes by hand using a very fine blade, or a “micro” blade (hence the name), depositing color with each stroke. As for color, I had read horror stories about incorrect color matches with other technicians. My big fear was the brown color being too warm (too red—a peeve of mine with my hair color as well), but I couldn’t be happier with my color match. I was told that the pain would be akin to a pin being dragged across your skin; not “painless” by any means but nowhere close to excruciating. In my opinion, this assessment is 100% accurate. I mean, I felt it and yes, it hurt, but not very much. It felt like the same pain level as ripping off a Band-aid or plucking a hair, except extended longer since each moment was the length of time it took to draw a stroke of hair. I agree with this review stating that the sound was probably worse than the actual pain. It hurt less than a Brazilian wax BY FAR. I’ll admit I’ve got a decent pain threshold (I’ve mentioned before that I epilate my armpits!) but in this case it was a complete non-issue and I think even a moderately pain-sensitive person could endure it easily. What I really liked about Piret is what an obvious perfectionist she is. It became very clear very quickly that she cared as much as I did about my eyebrows looking good. (Case in point, when I suggested I was so afraid of my eyebrows looking overdone that I’d rather there be no difference than TOO much of a difference, she responded curtly, “Well, I don’t want you walking around with bad brows with my name on them.”) She of course wanted me to be happy with what I saw, but that felt about equal in priority to her feeling happy with what she saw. Considering I trusted her pretty implicitly, this wasn’t an issue for me. One thing I particularly appreciated was how tailored to me and my brows my session felt. A good chunk of the appointment time was spent with Piret’s eagle eyes on my brows; She took her time assessing, drawing, tweezing, and assessing some more. It definitely didn’t feel remotely like a one size fits all approach, something I can’t stand and am generally quick to pick up on. I’m not going to lie: Piret’s a bit brusque and not remotely coddly. She has OPINIONS on what she thinks will look best on your face and what won’t, and she won’t hesitate to share those opinions with you. So if you’re looking for someone to hold your hand and tell you only what you want to hear, she’s probably not for you. However, if you are looking for what I see as the total package—as in the eyes, skill, and honesty of an expert (versus someone with a needle obediently doing what you want even if they don’t share your vision)—she’s your lady, hands down. When making this .GIF I realized it also doubles as a Before/After for my eyelashes! 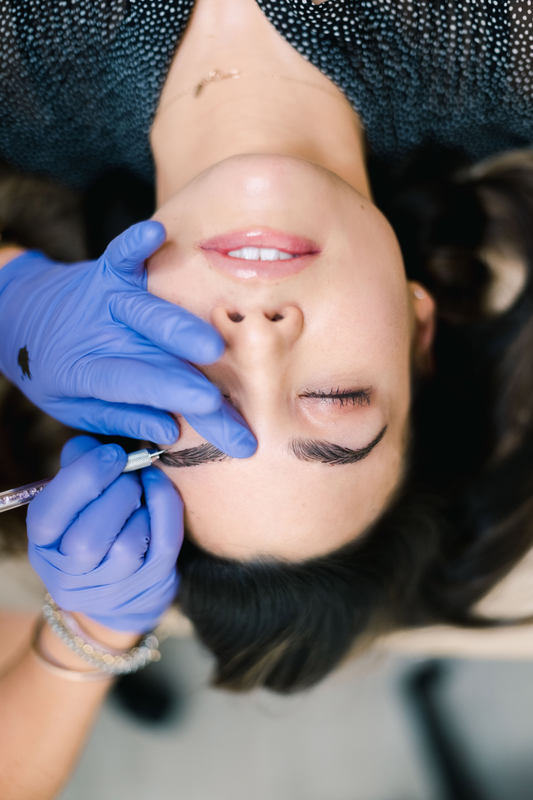 Microblading, unlike real tattoos, is semi-permanent. With proper care it can last up to 3 years. For the first couple of days post-procedure my eyebrows were a bit darker than they would end up. There was very slight scabbing in a few spots but it wasn’t noticeable to anyone but myself (Andy never noticed) and it disappeared within the first day or two. The most difficult part of the healing process was not being able to get my brows wet for one whole week. Piret sent me on my way with petroleum jelly which I smeared on my brows every morning and night before washing my face. The maintenance (or lack thereof) is the best part. I do make a little effort to avoid applying my P50, retinol, and other exfoliators directly on my brows, but other than that, there is no eyebrow babying. It’s safe to say the biggest potential deterrent when it comes to microblading is cost. Piret herself is $1500, which includes a touch-up a month or so following the initial appointment, while her associate Monica is $1000. In terms of my research, Monica’s price is pretty standard while Piret’s is on the high end, in line with other celeb technicians in LA. I do think, though, that unless you’ve uncovered some diamond in the rough, if someone (who isn’t your friend or who isn’t giving you a discount) is charging a conspicuously low rate, it’s probably a good idea to stay away. It’s your FACE and it’s semi-permanent; you don’t want to be someone’s guinea pig on their road to gaining experience. Did microblading completely change my face? No, but I never wanted it to. I wanted to specifically fix one thing that had been bothering me for years, and it did just that, plus some. I no longer attempt to fill in what isn’t there in the morning, and while I’ll still use a bit of tinted gel on occasion, for more “oomph”, it doesn’t feel like a necessity. Ultimately, the way I see it, it’s not about altering your looks but rather enhancing what you’ve got. Though I know my change is subtle and I didn’t NEED microblading, I love my results. If 100% au naturel is how you prefer to be, perfectly imperfect brows and all, then power to you! However, if your eyebrows are what’s standing between you and feeling 100% confident, microblading is definitely something to consider. Have you tried microblading? Is it something you’ve been wondering about? Let me know in the comments below!